Screenshot of Congress leader Hardik Patel's Twitter handle. 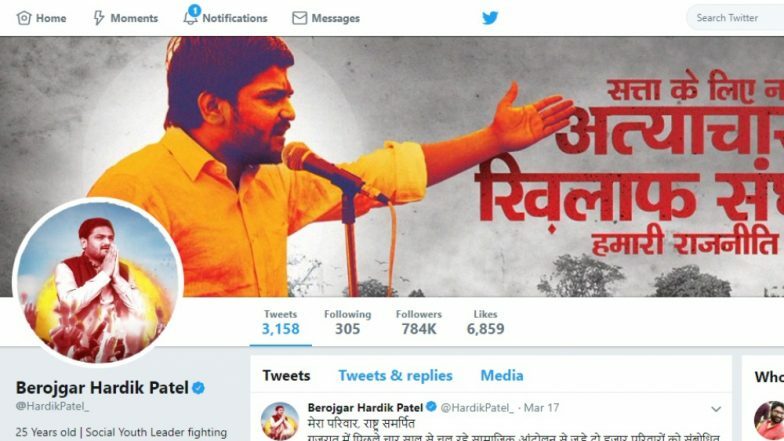 New Delhi, March 18: Days after Prime Minister Narendra Modi changed his Twitter name to ‘Chowkidar Narendra Modi’ to promote his ‘Main Bhi Chowkidar’ campaign ahead of Lok Sabha Elections 2019, Patidar leader – newly switched to Congress – took a swipe on Monday by changing his social media handle name as ‘Berojgar Hardik Patel’. The prefix ‘berojgar’ is a jibe at the ruling dispensation which made tall claims to provide employment to the youth of the country. It is to be known that soon after PM Modi added the prefix ‘Chowkidar’ in his social media handle and asked the party leaders to follow suit, it became a popular thing, and from political leaders to saffron party followers, everyone changed their social media names. Chowkidar Narendra Modi: PM, Amit Shah, BJP Leaders Add 'Chowkidar' to Their Names on Twitter.